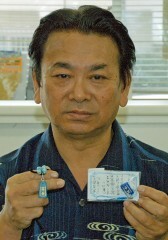 Takeo Medoruma, who wants to see the people affected by the earthquake return to their normal lives as soon as possible. At the Chubu Branch of Ryukyu Shimpo in Okinawa City on April 28. Aiming to make people happy in their daily lives, Takeo Medoruma, founder of RYUKYUKOKU MATSURI DAIKO (Ryukyu Kingdom Festival Drums), an international dance and drum performance organization that specializes in an exciting blend of traditional and contemporary Okinawan and Japanese music, has created cards that introduce 100 Okinawan words representing good luck. He has also created glass cell-phone charms and necklaces using a minsah pattern, a traditional Okinawan textile known for representing the desire for eternal love and happiness. Medoruma intends to send the cards and charms to Ibaraki to coincide with the opening ceremony on May 28 of a RYUKYUKOKU MATSURI DAIKO group in that prefecture, which has been affected by the Great East Japan Earthquake. The cards introduce words from the Okinawan dialect such as champloo (a mixture of various different things) and moai (the traditional Okinawan system of mutual assistance). 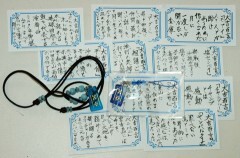 Cards with 100 words or phrases that were created by Medoruma, and glass cell-phone charms with the minsah pattern. Medoruma came up with the idea of creating the cards and charms after witnessing the devastating earthquake in East Japan. The Ibaraki chapter expects about 30 people to join. Medoruma will send cards and charms to the Sendai chapter, which currently has 14 members. Sendai is among the earthquake-stricken areas. He intends to send charms adorned with artwork depicting the fundu, a fixture that joins the boards on a sabani (a traditional Okinawan fishing boat), so as to represent the “bond” that exists between Okinawa and the earthquake stricken areas. Enagic USA donates 120000 500 ml bottles of water to victims of the Japan Earthquake.